Csaba the Innpug isn’t the only cute creature at the Inn on Mill Creek with a tail that wags. With its constantly wagging tail, good looks, and social butterfly attitude, the Eastern Phoebe is one of our favorite birds at the Inn. The Phoebe is also a longtime resident of the nest above the back porch door at the Inn on Mill Creek Bed & Breakfast, having constructed the nest in 2008. The Phoebe (we’re not sure it’s the same one, but we like to think so!) has made several upgrades to the mud and grass nest over the years, and we have helped a little as well…you might remember our blog post about the Extreme Makeover Eastern Phoebe Edition. Eastern Phoebes are flycatchers and since their diet is mostly insects, we don’t see them at the birdfeeders very often (although they do like to perch on the shepherd’s hooks from which the feeders hang and use them as jumping off points to grab a buggy snack). They have two favorite spots at the Inn on Mill Creek: the woods near the North Terrace Room (the back porch nest is nearby) and around the pond, where they teach their young how to catch dinner. 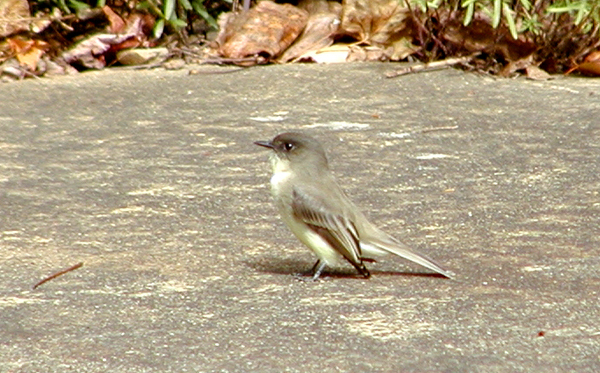 Sometimes, the Eastern Phoebe can be confused with the Eastern Wood-Pewee. They have a lot of similarities, but the Wood-Pewee is smaller and has more distinct wingbars, while the Phoebe is the expert tail wagger. If you see that trademark flick of the tail, chances are it’s a Phoebe. 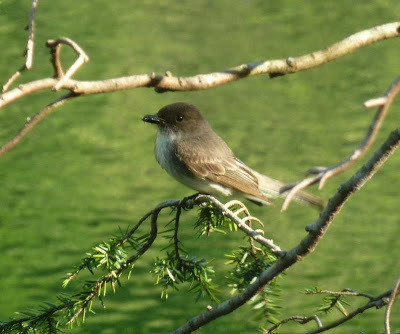 According to the Cornell Lab of Ornithology, the Eastern Phoebe is a year-round resident in our neck of the woods inside Pisgah National Forest. If they do migrate south, it’s not too far – just to states further south, such as Louisiana and Florida, and to Mexico and Central America. If you’re visiting us on the North Carolina Birding Trail and want to see our Eastern Phoebes, they are most active from April through September. 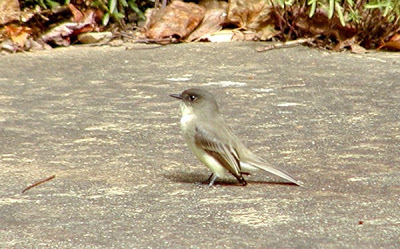 You won’t see flocks of Phoebes: Eastern Phoebes like solitude and rarely hang out with other Phoebes, even when they are mates. Eastern Phoebe females often build their nests on human-built structures, such as eaves of buildings, overhanging decks, bridges, and culverts. When John James Audubon attached a piece of thread to an Eastern Phoebe’s leg to track its return each year starting in 1804, the Eastern Phoebe earned the honor of being the first banded bird in North America.